With the holidays just around the corner, it's time to get baking! Made up of citrus cake layers, cranberry compote and citrus buttercream, my Citrus Cranberry Cake is the perfect dessert for your holiday parties. 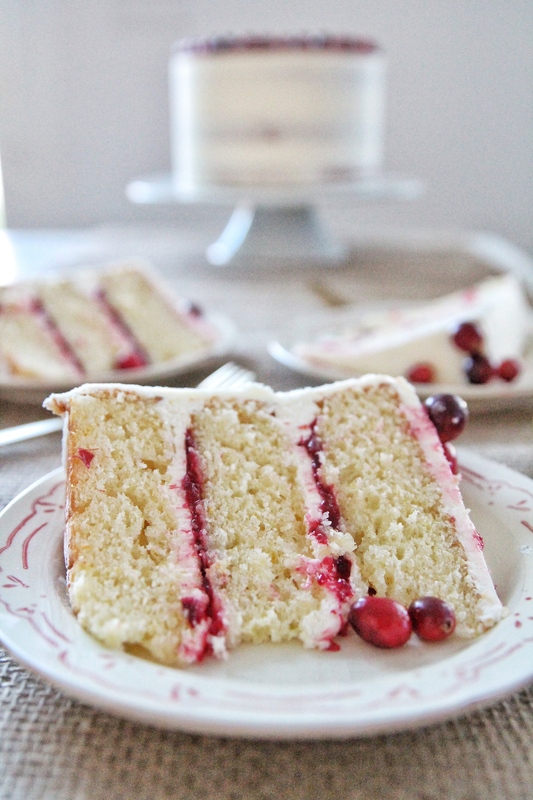 Yes, I know I got started on this Citrus Cranberry Cake early, but I couldn’t help myself! I love, love, love the holidays! Thanksgiving and Christmas! I may be playing Christmas music already, but I’m not the type to overlook Thanksgiving. I hold both holidays close to my heart. Thanksgiving and Christmas hold so many amazing memories from the past and have the potential for so many more in the future. Ryan and I try to spend the holidays with our extended families, carrying on the traditions of our childhoods, but since moving away from them, we’re also now starting our own traditions with our kids, and I couldn’t love it more. Growing up at my house during the holidays always meant sugar cookies and pies. And while you know I don’t love pie, I will say that my mom’s pies are the best! She’s nailed the pie crust, which was a recipe passed down from her mom. She’s best known for her pumpkin pie, lemon pie and apple pie. I may not eat them, but I appreciate my mom’s tradition of pie making more than she’ll ever know – because it’s not just about the pie. It’s about the tradition. It’s about the memory of learning from her in the kitchen. It’s about the time we get to spend together. Baking, whether it’s pie making or cake making (in my case), is about so much more than the food itself. Baking is memories. Baking is happiness. Baking is laughter. Baking is love. As the holidays approach, I’ve of course been thinking of new cake flavors. Not just any cake flavors, but flavors that you’ll hopefully always associate with the holidays and your memories of baking in the kitchen with your family. 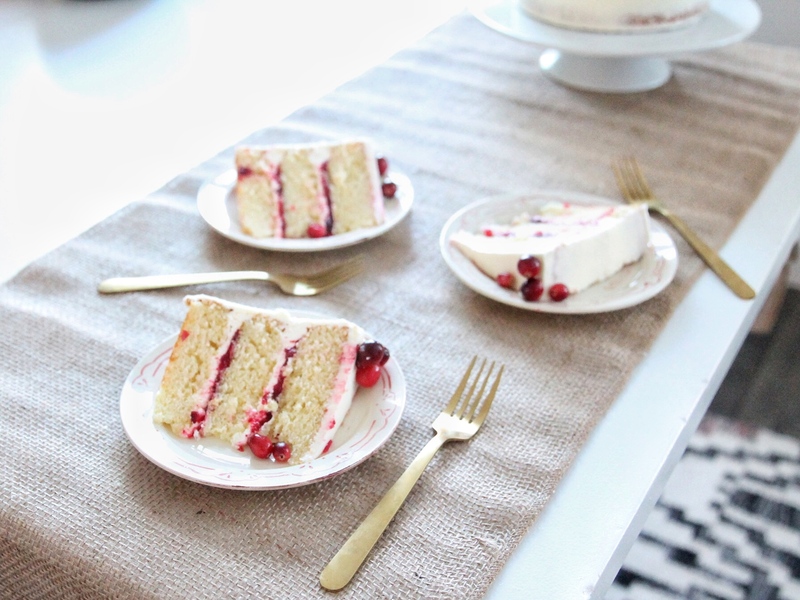 I want my cake flavors to be memorable for you, and I think this Citrus Cranberry Cake will be one of those. 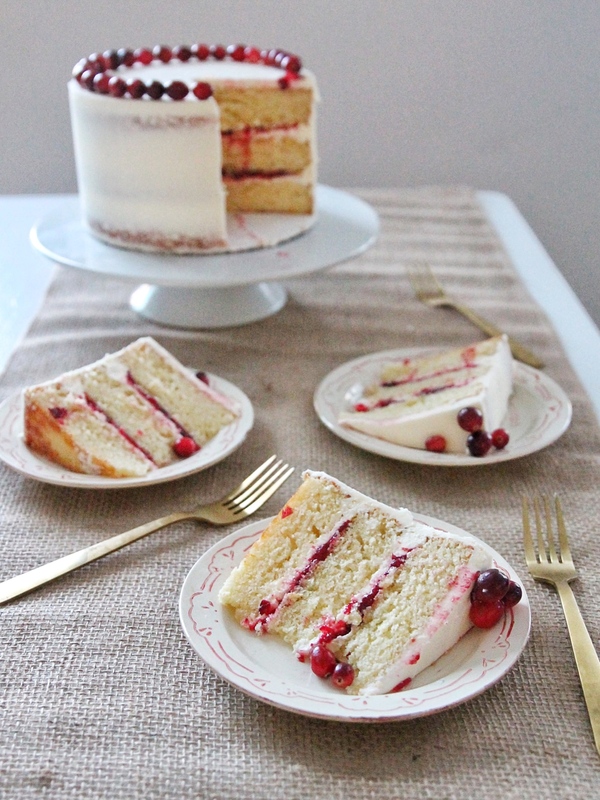 These cake layers are an adaption of the vanilla bean cake layers from my White Chocolate Cranberry Cake. The layers are a little more dense than most of my cakes (more like a pound cake), but I think it’s a nice change from the light and fluffy vanilla cakes you might be used to from me. 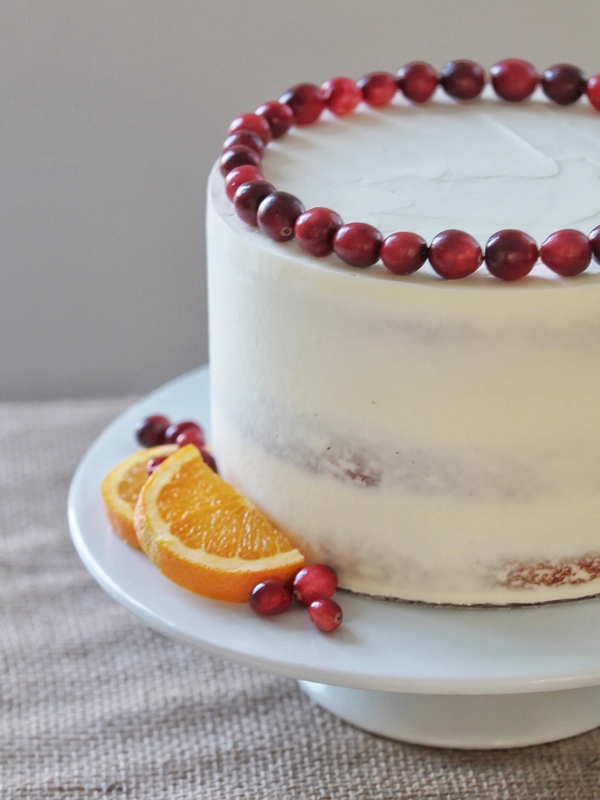 I added some orange zest to the cake layers, as well as the cranberry compote. I also added an orange simple syrup that you’ll coat the top of your cake layers with to amp up the orange flavor. The frosting has a bit of pure orange extract in it as well, but nothing overwhelming, in my opinion. I’m so happy with how this cake came together. The flavor is unreal and perfect for the holidays. 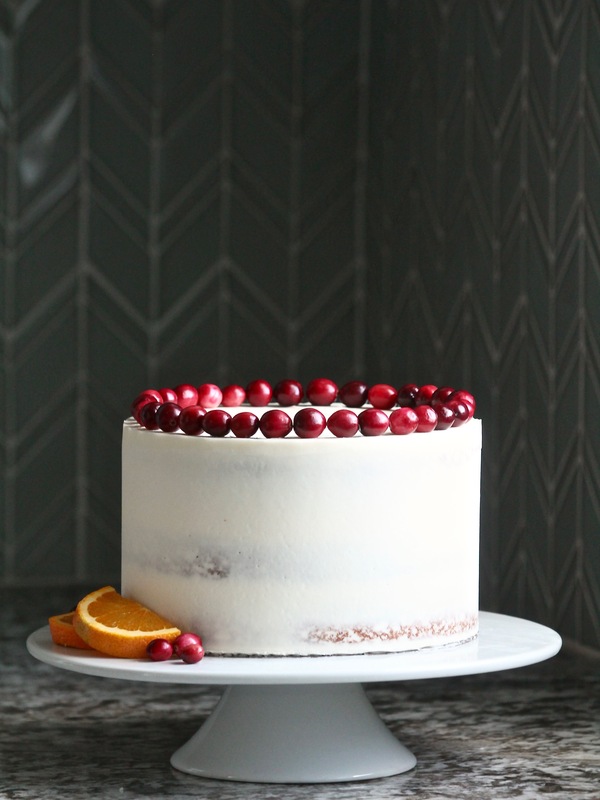 Made up of citrus yogurt cake layers, cranberry compote and citrus buttercream, my Citrus Cranberry Cake is the perfect dessert for your holiday parties. Preheat the oven to 350 degrees F. Prepare three 8-inch cake pans by spraying the bottom and sides of the pan, line with parchment paper and spray parchment. Set aside. Sift flour, baking powder and salt in a medium bowl. Whisk in the orange zest. Set aside. Cream the butter and the sugar on medium speed in a stand mixer fitted with the paddle attachment for two minutes, until light and fluffy. Add the eggs, one at a time, until incorporated. Scrape down the sides of the bowl. Add the greek yogurt and mix until incorporated. With the mixer on low speed, alternately, add the flour mixture and the milk, starting and finishing with the flour. Combine until incorporated. Evenly distribute the batter among the three 8-inch cake pans (about 18 ounces in each) and bake for 35 minutes or until a toothpick inserted in the center of the cake comes out clean. Let cool in pans 5-10 minutes before inverting onto a wire rack to cool completely. Once cooled, level if needed and then you can cover with plastic wrap and store in your freezer until you're ready to stack and decorate. An hour before you're ready to stack and decorate, take your cake layers out of the freezer to thaw just a bit. I like working with chilled, but not completely frozen, cakes. While the cakes are cooling, make the orange syrup. In a small saucepan, combine the sugar and orange juice. Bring to a boil, stirring to dissolve the sugar. After the cakes have cooled completely and are leveled (if needed) generously brush each cake layer with the orange syrup. In a saucepan, combine the cranberries, sugar and water over medium heat. Stir to dissolve the sugar and then cover to allow the cranberries to cook and soften. When the cranberries have softened and begin to pop, slowly add the sifted corn starch and stir until it is incorporated. (If you don't sift the cornstarch, you'll likely get white clumps in the compote that are hard to dissolve.) Add the orange zest. Allow the cranberries to simmer for another 5-10 minutes. The mixture will become thick and somewhat jelly-like. Transfer to a heatproof bowl and let cool to room temperature or store, covered, in the refrigerator until ready to use. In a stand mixer fitted with a paddle attachment, cream the butter on medium-high speed for about two minutes. With the mixer on low speed, slowly add the sifted powdered sugar until incorporated. Scrape down the sides of the bowl and continue to mix for another minute. Add the heavy cream, one tablespoon at a time. Once the cream is incorporated, add the orange extract increase the speed to medium-high and beat the frosting for five minutes. It should get lighter in texture and color. Level cake layers if needed. Place the first cake layer, right-side up, on a cake board or plate. Using a pastry bag or a strong plastic zip-loc bag, pipe a barrier around the edge of the cake. 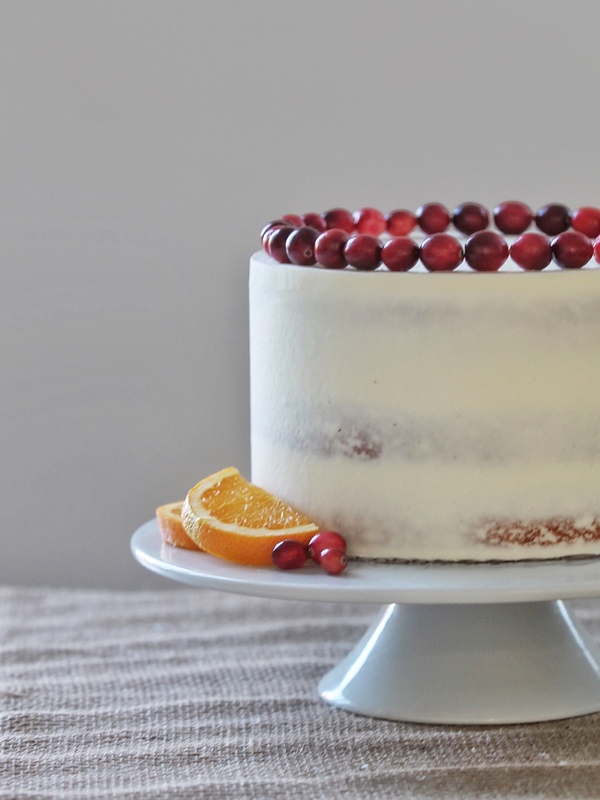 This is done to ensure the cranberry compote won't ooze out the side of your cake as your stack. Spread about half of your cranberry compote around the open space. Place second cake layer on top of the compote and create another frosting barrier around the edge, filling it with the remaining compote. Place third cake layer, top side down, on top and give the cake an even crumb coat. Chill it in the freezer for 10 minutes and then continue frosting. (While cake is chilling, I like to cover my frosting with plastic wrap so it doesn't have a chance to dry out). Hey Courtney! I’m making this cake today for my sister in law’s birthday dinner tomorrow. I just have a question about the simple syrup. If I’m going to be freezing the cake layers, do I put the syrup on before I freeze the layers or after I get them out of the freezer? Hi Courtney! 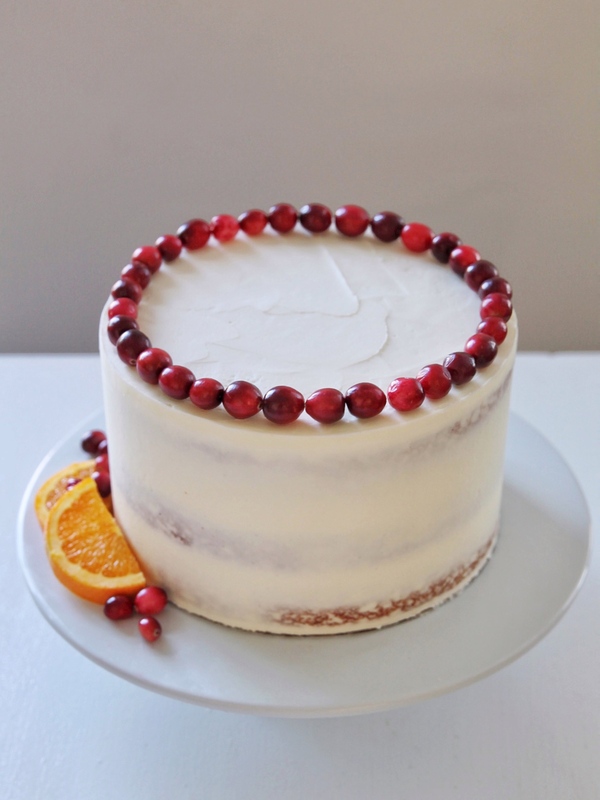 I am making this cake today, and I am just wondering if I am going to be freezing the cake layers, do I put the simple syrup on before I freeze the cakes, or after I get them out? Thanks! I’m probably too late but I usually put it on before I freeze the cake, but honestly it doesn’t really matter. If you wait to do it after it’s been frozen, that’s ok too. Hope you love it. Made this for Christmas. Halved the recipe and used 6in pans. I wish I would have made more cranberry filling. Every component blends, except the simple syrup. I forgot to add that part, but the cake was moist without. The frosting isn’t incredibly heavy, and I hate American buttercream. The cake, all around, is INCREDIBLE. Do you like orange cranberry sauce? You will adore this recipe. It’s that flavor combo in cake. Will absolutely make again.